Among the many counterintuitive theories that Jane Jacobs dispensed was that of the evils of parks: if designed and situated poorly, they could turn into vast dead spaces where unsavory characters could congregate and mischief could ensure. She preferred, instead, smaller, more intimate spaces with close connections to their communities. If Jacobs loved Washington Square Park, then she most likely would have swooned over "parklets." Arguably the most adorable urban space to come along in a long time, parklets are to Golden Gate and Griffith parks what amoebas are to elephants. They are multiplying, not by mitosis but by entrepreneurship, all over San Francisco � with Oakland, Long Beach, and other cities in California and elsewhere showing interest in the notion that parking spaces aren't just for cars anymore. The typical parklet consists of a platform that occupies between two or three curbside parking spaces. Typically made of wood and stylistically reminiscent of Scandinavian saunas, platforms sit flush with the sidewalk and usually includes seating and sometimes greenery. Parklets thus serve as outdoor rooms where passers-by can linger without contending with vehicles or pedestrian through-traffic. Parklets can also serve as outdoor dining areas for cafes and even landscaping features to introduce greenery into a streetscape. "Along any commercial corridor in San Francisco�probably in most places�people like to be outside, and they like to people-watch," said Andres Power, the director of the Pavement to Parks program at the San Francisco Planning Department. "It's part of what makes us humans, so [parklets are] sort of a no-brainer." Enthusiasm for parklets arguably has grown out of National Park(ing) Day, an annual event in which artists and urbanists take over parking spaces temporarily and replace them with art projects and other public amenities. Sponsored by the San Francisco design collective Rebar, National Park(ing) Day has grown to include thousands of sites in dozens of cities across the country. Parklets, however, are intended to be permanent fixtures in the urban landscape. As a relatively novel typology, parklets have prompted the San Francisco Planning Department to come up with regulations and procedures for issuing permits in relatively short order. The promotion of parklets is, according to some, a way for cities to atone for past offenses against the public realm. "We take out seating, we take out benches, we take out any amenity that would give people a reason to be there," said Blaine Merker, principal at Rebar. "That's sort of a bigger issue that Americans need to figure out and you see it in microcosm in parklets." "They've sparked people's imagination about�how they can be a part of shaping the public realm," said Ethan Kent, vice president at the New York-based advocacy group Project for Public Spaces. 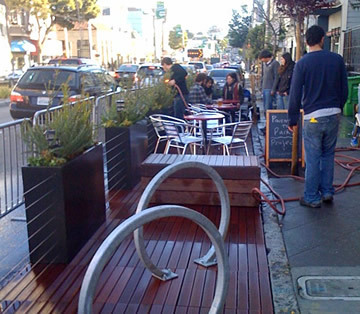 Under Power's direction, San Francisco's parklets program began with a pilot project established in front of the Mojo Bicycle Caf� on Divisidero Street in 2009. Since then, at least six more trial projects have been built. Power said he received 25 applications for his first round of parklet permitting and nearly 50 applications for the permitting round that closed June 16. So far in San Francisco, supporters of this sort of urban acupuncture have been plentiful and enthusiastic�to degrees nearly unheard-of in urban planning. "Generally, the program has been as universally accepted as a program can be in San Francisco," said Power. "We had very strong support from the top, all the way up to the mayor. The challenge was not �should we do this' but, �we are doing this; let's make it work as well as possible.'" Though the city has to issue permits for parklets, much as they would for other private uses of public space, such as sidewalk cafes or farmers markets, no public money goes into them in San Francisco. Parklets are constructed by "sponsors," which are usually individual businesses or collections of businesses that believe that they will enhance the public realm and even attract customers. For restaurants, a parklet can be a whole new dining room. "I feel very strongly about providing residents of the city with more open spaces," said Hanna Suleiman, owner of North Beach's Caffe Greco and sponsor of an early parklet. "The parklet itself was greeted extremely warmly by almost every customer I have." Access to parklets cannot, however, be limited to customers. The city and other supporters are adamant that any parklet�no matter how expensive and how closely connected to a business�must remain part of the public realm and open to all passers-by. Parklets in San Francisco are required to include signage to that effect. "It needs to be legible as a public space and inviting," said Hodge. There are enough potential sponsors such as Suleiman that, supporters say, the City of San Francisco and its dozens of distinct retail neighborhoods can accommodate a nearly limitless number of parklets. "The concept of a parklet is universal�it can work anywhere," said Power. "As long as you design for that constituency, the spaces are successful." In his effort to help parklets spread across the city, Power has coordinated a permitting process that, in San Francisco, as in many other cities, might fall through the bureaucratic cracks. Because they are located in the public right of way, parklets can fall under the jurisdiction of departments such as planning, public works, transportation and others and thus require strong political support to encourage departments to work together. Power said that his main goal has been to establish a permitting process that is inexpensive and specific, so that applicants are well aware of their responsibilities as sponsors to ensure that parklets are well maintained and accessible. As well, in order to achieve an acceptable levels of aesthetics, Power said that applicants must also adhere to a fairly rigid set of design guidelines in part so that he and his staff do not have to spend time parsing sloppy applications. Sponsors are also required to hold a minimum of $1 million worth of liability insurance; however, Power said that parklets are covered by most restaurants' and merchants' existing policies. Startup costs for a parklet include fees of nearly $1,000 to apply and have a site inspection, plus $650 for the removal of parking two meters and a $221 annual fee. 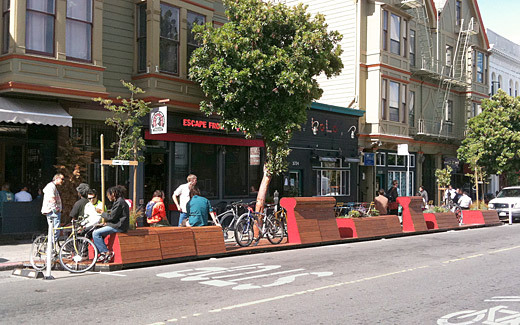 Kit Hodge, deputy director at the San Francisco Bike Coalition, said that the most successful parklets are those that gather strong neighborhood support even before a formal application is filed with the city. The Bike Coalition has been actively promoting parklets and, Hodge said, has been helping some sponsors with their outreach programs. Sponsors are responsible for gathering public support and ensuring that a proposed parklet fits with neighborhood character. In fact, said Power, reaching out to neighbors is a non-negotiable requirement for city approval. "It's important to create these things in ways that reflect the locals and helps preserve the identity of the neighborhood," said Kent. Power said that sponsors must demonstrate neighborhood support before they for a permit. The city will hold public hearings if a proposal generates opposition, but Hodge said that very few have gone to a hearing. Although parklets consume valuable urban parking spaces�often in neighborhoods where street parking is scarce, Power said that the whole point of parklets is to capitalize on existing patterns of pedestrian traffic and thus are considered unobtrusive. "One of the saving graces of this program....it's the businesses that are clamoring for this most," said Power. "There's a nexus that helps us move beyond the concern over parking loss." A basic parklet might simply be a wooden platform of 20 feet by 6 feet (the dimensions of two standard parking spaces), but so far architects and designers have found little end to the possibilities that they present. Designs include everything from bare platforms on which merchants have placed tables and benches to swooping topographical features and benches integrated into the structures themselves. Other features include railings, planters, stand-up bistro tables, raised platforms, bike racks, and decorative bollards. "They look relatively straightforward but a lot of thought has gone into how to use every inch of that space," said Blaine Merker, principal at the design and art collective Rebar, which has promoted and designed several parklets. "It's tight real estate." While a parklet might cost less than, for instance, an addition to a caf� dining room, they do not necessarily come cheaply. Power estimates that the design, construction, and planning for a basic 120-square-foot parklet costs between $5,000 and $10,000, plus upkeep, per parking space. Merker said that cost compared favorably with the $2 million per block that a recent upgrade of Valencia Street cost. "That was a lot investment for a 2-foot change in the curb line," aid Merker. "(Parklets are) an opportunity to test out in prototype new kinds of public spaces before we commit in bricks and mortar." Despite architects' and sponsors' enthusiasm for parklets, their economic impacts are as yet undetermined. Power's office conducted a small survey to study the impacts of the initial Divisadero Street parklet and found modest gains in pedestrian activity on the block around the Mojo Caf� and a stronger sense of "community character." The survey found, however, that local businesses did not necessarily attract more customers. But warm feelings for parklets may transcend cost-benefit analyses. "Am I making a lot more money with it? I don't think I am," said Suleiman, of Caffe Greco. "But it creates ambiance and aesthetically improves the look of the neighborhood." Whether parklets stoke business or end up being expensive planters for the sponsoring businesses, the general public in San Francisco has, according to Power and others, embraced parklets wholeheartedly. "Compared to a lot of other new infrastructure ideas, these have had very little public opposition," said Hodge, of the Bike Coalition. Power said that some neighbors have raised concerns over lost parking, and Hodge noted that many residents simply do not understand what parklets are. Power admitted that parklets could attract loitering and homeless. However, he said that parklets also provide exactly the sort of vibrancy and street life that tends to ward off unsavory activities. "It has built-in eyes on the street," said Power. "Because the funding entity has invested some capital in building the project�there's a vested interest in ensuring that the space is used appropriately." The only problem, according to Merker, is that because of the need for private funding, certain places might get too much of a good thing. "I worry about a two-tiered system of public space development where the nicest public spaces are out in front of the merchants who can afford to pay for them," said Merker. "I'd love to see somebody for a scholarship fund�for maybe a mom and pop who don't have money for improving the public realm." Many of those cities are now catching on to parklets as well. Merker and Power both said that they have received inquiries from cities across the country to inquire about setting up parklet programs. Whether parklets can survive outside their native San Francisco habitat, remains to be seen. In fact, options in other cities might be limited than they are in San Francisco's famously vibrant streets and distinctive neighborhoods. "(Parklets) do happen to be in neighborhoods that have businesses and pedestrian traffic and retail that can benefit from it," said Kent. The City of Oakland's planning department is working towards a formal pilot program that could launch this year. Oakland Deputy Director of Planning and Zoning Eric Angstadt said that planners in Oakland are enthusiastic about parklets but that, as elsewhere, the Planning Department alone cannot singlehandedly authorize their construction. "It's one of those newer ideas that doesn't stick conveniently in any one department necessarily," said Angstadt. However, Angstadt noted that parklets naturally fall under the purview of planning because "they tend to grow out of more planning-focus things like streetscapes and transportation demand management programs, and alternative parking strategies." As well, the city's well known financial crisis has forced Angstadt's team to consider lost revenue at parking spaces that might be commandeered for parklets. "With the city's budget the way it is, it has to be revenue-neutral," said Angstadt. He suggested that the issuance of permits for parklets could be contingent upon sponsors' identifying new spaces for paid parking to offset lost revenue. David White, redevelopment project officer with the Long Beach Redevelopment Agency, said that he would like to help bring parklets to Long Beach but that that he is concerned about identifying appropriate funding schemes. White said that private funding "would be outstanding," especially given the precarious nature of redevelopment agencies in California, and suggested that business improvement districts�which pool funds from businesses�might be ideal sponsors for parklets. For all the money and planning that can go into a parklet, even their supporters say that they will be truly successful only when they are torn down�in favor of something more lasting. For Power, parklets are one step towards encouraging public bureaucracies to invest in the pedestrian realm. "Parklets really (make cities) think about things in a more pragmatic way to think about change on the street as being a good thing, to think about temporary uses as being a good thing," said Power. "That is not endemic to the bureaucracies of the typical American city." Merker said that cities' embrace of parklets should, ultimately, lead to investments that will make parklets obsolete. "These are not a permanent solution," said Merker. "We still need to make really good permanent public spaces." Photos courtesy of Rebar and S.F. Bike Coalition, via Pavement to Parks.